I didn't even know that my high school friend Richard had a second life as rapper Richie Cunning until he emailed me yesterday. I didn't even know he rapped. I should become a rapper. It seems like fun. 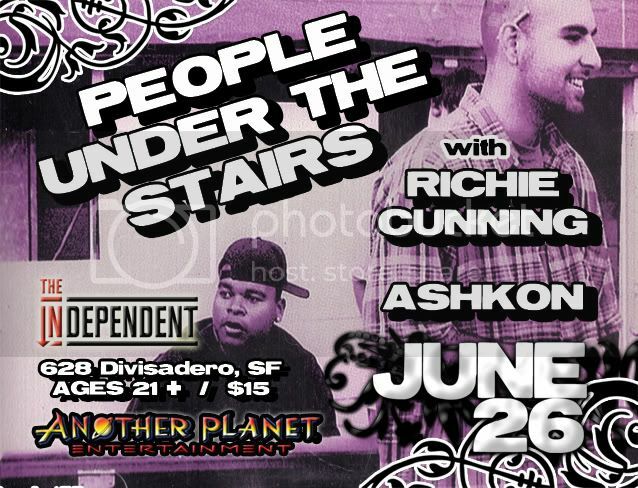 Anyway, Richard aka Richie Cunning and our man Ashkeezy are opening for West Coast hip-hop stalwarts People Under the Stairs on Thursday night at the Independent in San Francisco... a great place to see a show, walking distance from my old apartment. Whether or not you live in the Sco, you can download Richie's new single, "The City," which is a fantastic tribute to the best city in the world. Also, the N Judah. I think my first single's going to be about the 49 Van Ness-Mission. Thanks to Josh for sending me this video of the greatest thing ever to happen in a baseball game ever.